Modern fuzz are an instrumental metal power trio based in Baltimore, MD. After guitarist Alex King and drummer Levi Beverly initially met over the now-defunct app Yik Yak, the pair swiftly recruited bassist Eric Turnquist, who Beverly had played with previously. Whilst the band went on to unsuccessfully audition a series of vocalists, they eventually chose to operate as an instrumental band and wasted no time in writing and recording their debut EP. The resulting self-titled product showcases an immensely-talented trio of musicians with a clear-cut sonic identity and a huge amount of potential. Warping feedback ambiguously opens the EP, before breaking into the hard-hitting main riff of ‘Madness’. Genre-wise, the track is strongly rooted in the progressive metal genre, drawing heavily on bands such as Dream Theater and King Crimson. One of the band’s biggest selling points becomes apparent almost immediately; their phenomenal musicality and chemistry as an ensemble. The band make use of an array of complex musical devices, including off-time sections, complex harmony and a series of time signature changes. The track itself features a variety of different sections, from the hard-hitting main riff, to clean interlude sections, to virtuosic solo breaks. Whilst the music is indeed very technically accomplished, it never once becomes overbearing. This shows the members have clearly kept the needs of the arrangement itself at the very forefront of their minds whilst writing their parts, effectively adhering to the philosophy of ‘playing the piece, not the instrument’. This displays a good sense of musicality as well as good attention to detail. The band are also very tight rhythmically and clearly feed off of one another; Turnquist and King exchange melodic ideas at a mind-blowing pace, whilst Beverly relentlessly drives the momentum forward. This stands as testament to their chemistry as a band, which is something I’d strongly advise them to place at the forefront of their marketing. ‘B.B.’ is another hard-hitting track with a helplessly-catchy main riff. Particular praise on this track goes to Beverly for a fantastically-written drum part. His double-bass work is outstanding, adding a real edge to key points of the arrangement without overusing the technique. His fills are also excellent and effortlessly guide the band from section to section. His transitions from half-time to full-time are also very notable, changing between the two frequently without allowing the momentum to drop. King’s guitar work is also very good; there are several guitar solos which feature a heavily reverberated tone, which I felt were true highlight points of the track. He also makes fantastic use of ambient feedback, which add a real sense of presence to the material and pass the limelight to Turnquist, who carries the main melodic material during these sections. This once again stands as testament to the band’s excellent musicality. ‘Daydream’ is a much shorter track, contrasting sections of hard-hitting riffs with ethereal-sounding clean guitar sections. Turnquist truly takes the limelight here, carrying the vast majority of the melodic material and serving as the core substance of the arrangement. His dynamic range is also excellent, making use of a distortion pedal in the heavier sections and finger-picking in the more stripped-back sections. At this point, my attention turns to the band’s adherence to the power trio format, which is overall fantastic. King consistently ensures his tones are full-bodied and well-rounded, effectively filling out the midrange and contributing to a truly larger-than-life sound. Turnquist primarily employs melodic bass parts, which effectively keep the band glued together on each track. In addition, he makes use of distortion during heavier sections, which effectively contributes to filling out the midrange that the band aren’t obtaining from a vocalist or a second guitarist. Beverly employs a heavy delivery on tightly-tuned drums, which consistently uphold the momentum and once again contribute to filling out the midrange. ‘Soft Serve’ showcases some fantastic guitar work from King; the main clean riff is overdubbed with harmonics, reverberated feedback and sustained chords. At this point, my focus turns to how the band’s material would best work in a live setting. Whilst the band do indeed have a real sense of chemistry between them and would undoubtedly be very capable in a live setting, the EP features an array of guitar overdubs on most tracks. As these add a significant amount of presence to their sound, it might be worth considering how they’d like to replicate this in a live setting. One option could be for King to use a loop pedal in certain sections or for the band to employ backing tracks. In addition, I strongly believe that synth would add a wonderful new dimension to the band’s sound, even if it’s simply placed low in the mix to aid in filling out the arrangement. As foot-controlled synth pedals are also available, this means the band would easily be able to incorporate synth sounds into their live shows. ‘1-800-Hamr’ is a darker track set in 5/4. Turnquist introduces much of the melodic material against warping guitar feedback, before King enthusiastically joins the arrangement. Beverly also makes frequent use of his toms on this track, which compliment the feedback sections nicely and add a larger-than-life aspect to the arrangement. The band change from 5/4 to 6/8 at the midpoint of the track, which I felt was very well-executed and a very unique time signature change. My attention now turns to the band’s sonic identity, which is very well-focused and thoroughly-channeled. 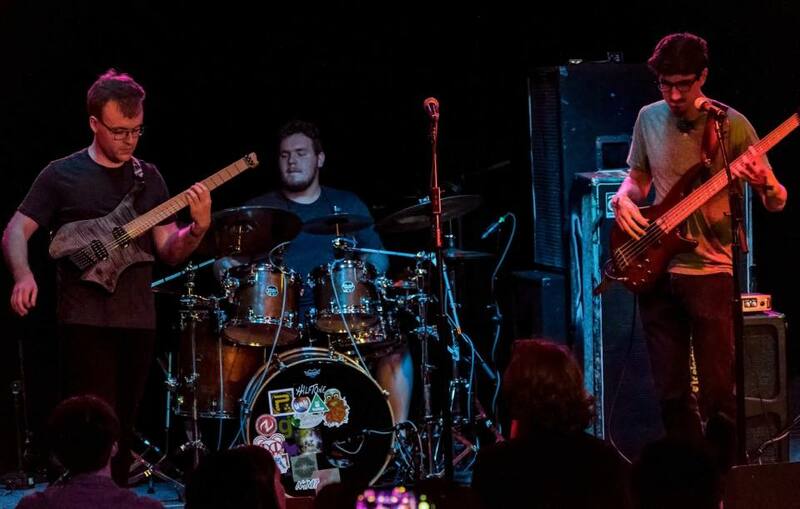 The band consistently make use of the progressive metal genre, which provides a sense of consistency and coherency that many bands struggle to achieve on their debut EP. In addition, the band have carved out a whole host of signature traits for themselves that contribute to a clear-cut ‘Modern Fuzz’ sound; these include warping feedback, time signature changes and complex riff work. I’m very much looking forward to seeing how the band choose to channel their genre and refine their signature traits on future releases in order to further-develop their sonic identity. The EP rounds off with the nine minute epic ‘Motus’, which is undoubtedly one of the heaviest tracks on the EP. Dissonant harmony sits atop pounding drums with the track moving at a relentless pace, before being contrasted by ethereal-sounding stripped-back sections. I felt this effectively brought things full circle from the opening track and served as an effective conclusion to the EP. Lastly, my attention turns to the EP’s production, which is overall fantastic. All instruments are very well-recorded and it’s clear the band have taken adequate time to obtain appropriate tones and takes at the source, leading to a very convincing final product. The mixing and mastering work is also excellent, with all levels and frequencies being well-balanced and the production having a consistent feel to it from track to track. Overall, ‘Modern Fuzz’ serves as the perfect introduction to an immensely-talented band with a strong sense of musicality and a well-formed sonic identity. I’m certainly excited to see where they choose to take the project over their next few releases and am confident they’ll make major headway in the coming years. Highly recommended for any fans of progressive metal.